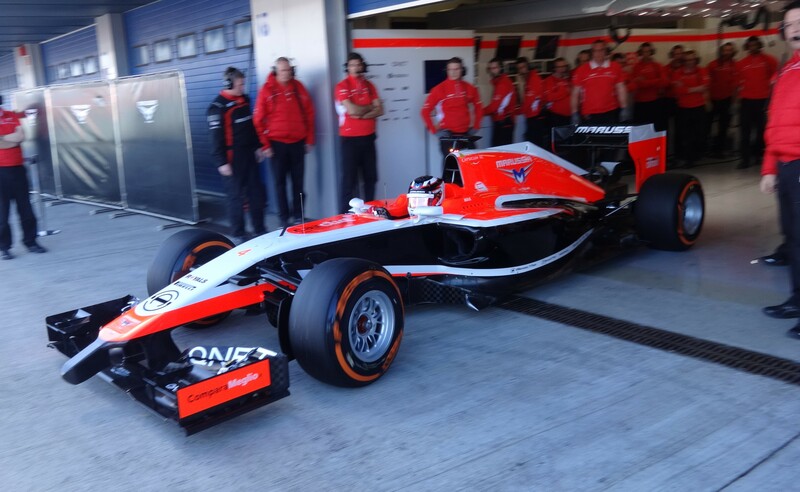 Max Chilton has given the Marussia MR03 its first lap of Jerez after the team was forced to miss the first two days of running. Team boss John Booth said: “As we saw in the step from 2012 to 2013, we have young but experienced and extremely talented technical and engineering groups within the Marussia F1 Team, who have contributed enormously to our rate of progression over the past couple of years. To have designed a car that is true to the concept first conceived in early 2012, despite the integration of an entirely new powertrain and whilst pushing hard to attain our 2013 Constructors’ Championship objective, is a testament to the extent to which we have matured as a technical organisation. “Through the course of 2012, we analysed every single element of the car,” said chief designer John McQuilliam. “From the tip of the nose to the trailing edge of the rear wing – knowing just how radically different the MR03 would be under such sweeping Technical Regulations. We have benefitted enormously from the stability of our design teams, with the same personnel beginning – and now concluding – the process over a 24 month period. I think we can feel justifiably proud of the way we have responded to such a significant challenge and the quality of car we have arrived at with the MR03. “The car has been manufactured and finished to a very high standard, whilst achieving our most significant weight-saving targets to date and, importantly, with a crucial eye towards maintaining our excellent record of reliability. Without doubt, the greatest design challenge has been in terms of cooling, yet this is one of a few areas where we are not only very pleased with the design response, but also the degree of innovation we have achieved with our solution. Looks to have all the bits in the right places, so pretty conventional and competant. With that thought, we’ll have a better chance of assessing their ability to play this season. Always liked them.